Digitally Printed Labels. The Long and the Short of It. Digitally printed labels are gaining ground with features that enable personalization and economical short runs. The ability to offer cost-effective runs in the hundreds presents value to start ups as well as big brands looking to bring label production in house. 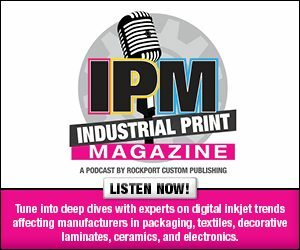 Print service providers (PSPs) hoping to add a new revenue stream may want to consider investing in printing and finishing equipment that supports digital label production. Some wide format printers and printer/cutters are well suited for this application, as well as stickers and decals. Dedicated digital label systems are another option. A wide format printer/cutter presents more opportunity than the average PSP may expect. A variety of these devices offer expanded capabilities such as varnishing, embossing, and contour cutting—ideal for label, decal, and sticker production. Located in Welcome, NC, RCR Graphics Center is a print shop dedicated to producing graphics for Richard Childress companies. The PSP started in 2010 as an exclusive race car graphics provider for NASCAR driver Richard Childress. From the beginning it used digital print technology to provide race car graphics in house. “We became the first team in NASCAR to do so,” admits Nick Woodward, graphics manager, RCR Graphics Center. The company was first established as a means to save money, time, and be more confidential for Richard Childress’ race car wraps. “We also wanted to have control of our brand with the design process all the way through the installation process,” adds Woodward. RCR Graphics Center quickly expanded and now offers a variety of graphics for additional Richard Childress companies and local businesses. With a total of eight employees, it operates from a 7,500 square foot workspace. Roland DGA Corporation powers the RCR Graphics Center with a fleet of digital presses including the Roland TrueVis VG-640, VersaUV LEC-330, VersaUV LEJ-640FT, and two SOLJET Pro XF-640 printer/cutters. “Roland printers are user-friendly machines that print great colorswith easy-to-use VersaWorks RIP software,” offers Woodward. In addition to VersaWorks RIP, the print provider also uses Adobe Illustrator and Photoshop. RCR Graphics Center quickly grew comfortable with producing digitally printed race car graphics. In 2011, the PSP decided to add additional services and take advantage of its presses by producing short-run labels for Childress Vineyards in Lexington, NC. A typical label order for Childress Vineyards is generally 100 labels with two-sided printing. RCR Graphics Center prints its labels on the Roland VersaUV LEC-330. It offers the ability to print, varnish, emboss, crease, and contour cut with one device. The VersaUV LEC-330 handles media up to 30 inches wide and prints up to 101 square feet per hour. According to Woodward, the VersaUV LEC-330 allows Childress Vineyards to quickly run small jobs at any time for any event. It prints for weddings, RCR wins, holiday gifts, and special bottlings. The Roland VersaUV LEC-330 is currently the only printer the company uses for label printing. It offers the ability to use CMYK, white, and clear coats for special effects ranging from gloss or matte finishes to custom textures and simulated embossing. For short-run label production, print providers print CMYK plus white on foils, BOPP, PE, PET film, and offset printing stock. For digital label printing the PSP uses Roland UV ink and Avery Dennison Graphics Solutions MPI 3303 Series. MPI 3300 is a flexible, calendered vinyl film that features a permanent adhesive. It’s designed for short- to medium-term graphics for applications such as general signage, labels, and point of purchase displays. “We use Avery Dennison on our race car wraps, so we asked them what product would work well for printing on the UV printer along with applying to a wine bottle,” explains Woodward. Advancements in digital technology affect label production growth. For RCR Graphics Center, the ability to print and cut on the same device helps them a lot. “We can send the job to the machine and not have to worry about it until it is finished,” he adds. While a wide format digital printer/cutter is one option for producing digitally printed labels, other PSPs opt for a dedicated narrow format label press. These devices are exclusively designed for digital label production in short runs, with the ability to add customized features. Established in 2007 in Westfield, IN, DuraMark Technologies, Inc. started with four employees in an 800 square foot workspace. Since the start its primary focus is the durable label space with full design services. The company now has production facilities in IN, WA, and WI—totaling 26,000 square feet. With 67 employees, DuraMark Technologies offers labels and product-specific kitting. The majority of its clients are North America based. Bill Bussick, president/founder, DuraMark Technologies, worked in the printing industry for over 30 years with large national printers that offered label printing as well as other types of printing. In 2003, while at The Relizon Company, he recognized a need in the marketplace for a device that could digitally produce durable labels in small quantities. 95 to 98 percent of the PSP’s business is label production with a primary focus on the durable decal space for branding, warning, and instructional markings. The majority of its customers are industrial manufacturers seeking durable labels that last years. The company also creates labels for consumer products, healthcare, heavy equipment manufacturing, automotive, and transportation. According to Bussick, many of these products remain outdoors and also have to withstand harsh environments. Digital print engines are the only devices that DuraMark Technologies used since its start. The majority of its printing is completed on Durst Image Technology US, LLC Tau 330 UV inkjet printers. The Durst Tau 330 is exclusively designed for digital labels and specialty packaging. It features a print speed of 157 feet per minute and enables a configuration with up to seven UV inks, including CMYK, orange, violet, and white. Aside from its Durst digital presses, the label manufacturer also utilizes thermal transfer and dry toner print engines, but the majority of its work is produced with inkjet. With its digital presses, DuraMark Technologies offers a printable width of 12.5 inches. “As technology improves, we take advantage of those improvements,” offers Bussick. He believes inkjet technology gives the company an advantage over thermal and toner-based print technologies, primarily in speed and color capabilities. For label production, DuraMark Technologies develops and utilizes proprietary media. “It is important to have a finished product that outperforms the industry standard for durability,” says Bussick. DuraMark Technologies’ engineered and manufactured custom finishing equipment laminates, laser die cuts, and sheets the finished product in a single machine. According to Bussick, the company may be the first all-digital durable label manufacturer in the country. “Our clients want the ability to get finished products fast without investing in inventory to achieve that,” he explains. With its digital print technology, DuraMark Technologies produces label quantities cost effectively as low as one due to no required setup or hard tooling costs such as screens or dies. In fact, Bussick says educating his clients on digital is interesting as they are accustomed to long lead times for new items in a four to six week range. “When I tell them our standard lead time is three to five days and if needed we can have the finished product in minutes, they can’t believe it,” he shares. The definition of a label kit varies and is often referred to as several cut labels placed in a plastic bag or a sheet of standard labels that are applied to product models. DuraMark Technologies’ approach to kitting offers the ability to place every branding decal, safety label, and instructional label onto a single sheet. With its digital print technology, the company customizes kits for each specific product including the ability to customize down to the serial number level. “Our clients regularly tell us that using our kitting approach helps them facilitate a more efficient production process, better adapt to changing requirements, and improve error proofing for their production/assembly teams,” says Bussick. Digital label printing equipment comes in many forms from narrow format dedicated systems to wide format printer/cutters. Adding digital to a printing environment enables PSPs like RCR Graphics Center and DuraMark Technologies to effectively handle short-run demands as low as one. Both of these PSPs indicate growing interest in digital label production and the variety of solutions available support this demand.